A group of second-year students asked me to contribute a ‘Real World Stats’ piece to their new psychology publication, MAZE. I reworked a section from of my most popular statistics lectures on probability theory and roulette. Below is the article in full. Roulette is a straightforward casino game. While the wheel is spinning, a ball is released. This ball eventually ends up stopping in a numbered (1-37) and coloured (red or black) pocket. You bet on the final resting place of the ball by selecting a number, range of numbers or a colour. When betting on colours, if you pick correctly, you double your money. A £20 stake on black would get you £40 back if the ball landed in a black pocket, and nothing back if it landed in a red one. A few years ago, I received quite a few spam e-mails with the following tip on how to win at roulette. > bound to go black eventually (it’s 50/50) so that way you eventually always win. If you ignore the atrocious spelling and grammar, the basic idea seems to be a good one. In fact, it’s an established betting strategy known as the Martingale system. Under this system, you double losing bets until you win, that way you will always win an amount equivalent to your first stake. 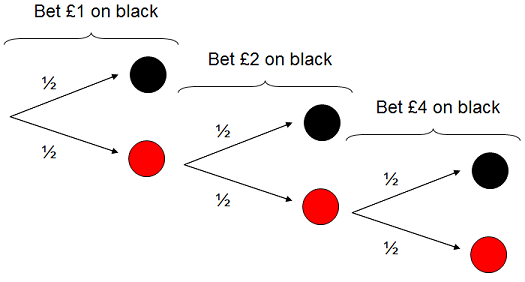 If we build a probability tree for a gambler who only bets on black and provide her with a fairly standard outcome, two losses followed by one win, you’ll see how this is meant to work. An unsurprising outcome under the Martingale system. Bets on black are unsuccessful twice, before paying off the third time. Over three bets, she has spent £7, but won £8. Not too shabby. She just needs to do this over and over until she has won an amount she’s happy with. Fool-proof, right? Not quite. Casinos have stayed in business over centuries for a reason: they know how to work probabilities. One of their standard strategies is to have minimum and maximum stake limits, with a typical range of £10-£1000. These limits expose a huge flaw in our spam-based strategy. Imagine you’re trying the Martingale strategy and you go on a losing streak. £10, £20, £40, £80, £160, £320 and £640 all go on losing bets and all of a sudden you’re down £1270. Here’s where you come up against the casino’s maximum bet policy. You can’t place a £1280 bet to recoup your losses. But how likely is losing 7 bets in a row? Minimum bet: £10. Maximum bet: £1,000. It takes seven straight losses to break the Martingale system. Not very likely at all, if you’re only trying to win £10. According to the multiplication rule for independent events, the exact odds are (1/2)7 which is equal to .0078. Put another way, the probability of this happening is 1 in 128. But here’s the kicker. If you want to double the money you bring to the casino to place these bets, you’re looking at close to a 2 in 3 chance that you will lose everything. “I’m not greedy!” I hear you cry. “I’d just want to go home with a little more than if I had invested the money and not had any fun at all.” Let’s say you wanted to take home a little more than, 6%, the best savings interest rate you can currently find on moneysupermarket.com (as of when this article was written). How much would you need to win? You would need to win 8 times in a row to go home with a little more than a 6% interest rate. And what are the odds of this happening? Put another way, 15 out of 16 times, you will exceed a savings account interest rate. You will enter the casino with £1270 and leave with £1350. But, 1 in 16 times you will leave the casino with nothing. Not even enough to get the 99 bus back over the Tay. Sadly, this sort of thing is all too common, especially when people are new to gambling and thing they have found a way of beating the system: e.g. http://casinogambling.about.com/od/moneymanagement/a/martingale.htm. Even if you find a casino with no maximum bet, you need huge financial resources to make it work. It all starts to seem even more hopeless when you factor in something I neglected to mention at the start. Your odds of winning are actually worse than 50%. If the ball lands on 0 the casino takes all the money. The take-home-message? It’s probably best to ignore financial advice you read in your spam folder. EDIT (17/1/2014): A link to moneysupermarket.com was removed following receipt of an email from a moneysupermarket.com employee requesting that I comply with their request of ” removing or adding a nofollow attribute to the links to our MoneySuperMarket.com website”. Doing a quick search to find out why reveals https://groups.google.com/forum/#!topic/FleetStreet/HDVHXFwQFdI, which suggests that this is all about SEO optimisation such that “some [links] may look un-natural or paid for in the eyes of Google. This unfortunately means that we have to take down a large number of our links, some of which were genuine and of use/interest to users of the sites on which they were posted”. The suggestion on that last link is that moneysupermarket.com might be doing this because they have previously been penalised for paying for links to their site and are now doing what they can to stop this perception. I don’t know what authority they have to enforce removal of links like this (none I suspect), but I don’t really care enough to kick up a fuss… link removed. Posted in Stats.Tagged Casino, Gambling, Martingale, Probability, Red or Black?, Roulette. Surely, even leaving all these refined calculations on one side, there is another, very simple way the casino stays profitably in business: there is at least one zero on the wheel, and frequently two. This invalidates all non-zero bets if the ball lands in it, and means that the probability of a “black or white” (or “odd or even”, or “high or low”) bet paying off is not 1/2, but 1/2 less the probability of the ball landing on a zero. Even without a stake limit, this is a guaranteecd moneymaket for the casino. Hi John. The 0 (and 00) wouldn’t stop a punter coming out on top if the Martingale system worked. The Martingale system relies on incrementally increasing your stake to cover your losses whatever the odds. You’re right that the 0s decrease the chances of winning to below .5 which, under the Martingale system would simply mean that you would need to make make more bets on average to cover your losses. This plays into the casino’s hands at the maximum bet stage as it makes it more likely that you would exceed the maximum bet threshold. But, if there was no maximum bet then theoretically you would be able to win under any odds with the Martingale system (even odds of .1) as long as you had access to an infinite pot of money. I believe its possible to make money on the roulette over time, if you monitor the continuing results of the spinning wheel as different markets. The point is to take advantage of extreme overweight or underweight of obe such market. Example: During the last 30 spins there have been 26 wins on BLACK. If you place all bets on RED for the next 30 spins you would most likely be profitable. Does not have to be all 30 spins, it can also be until you reach a certain profit. Now, with this strategy, I would not use RED/BLACK but columns, lines etc. Also, I would use a roulette software to keep track of the statistics as the results progresses. You’re right that over thousands of trials the 50:50 ratio would likely even out inasmuch as a disparity of 11 would pale in comparison to the ~50:50 split of the 1000s of outcomes that are congruent with the 50:50 odds. The problem with roulette is that you can’t use a counting strategy as all roulette statistical events are independent. This is different to the situation in card games where cards are effectively removed from a deck once they are played meaning that the odds can be updated based on awareness of this information. The independent events in roulette are analogous to the simple situation of coin tossing. If you toss a coin 10x and get 10x heads, you aren’t more likely to get tails on the next toss (if I was playing devil’s advocate I might even encourage you to bet on heads again as if there is a non-independence, I would suggest it is most likely to exist as a bias in the coin toss). You’d be correct in stating that 10/11 coin tosses being heads is more likely than 11/11 coin tosses being heads, but this is only when the odds are calculated before the first coin is tossed. This is because the 10/11 heads odds gives the opportunity for the tails toss to occur at any one of the 11 times you toss the coin. Once you restrict this opportunity to only one coin toss, you’re back down to 50:50 odds. I’m afraid the same goes with roulette. Rather unfortunately for my students (at least in your opinion), I teach statistics at St Andrews University. This is interesting as I never realized that it was only a 1/128 to get 7 in a row. I play on American board which is 1-36 and 0 and 00. I frequently see several red (or black) in a row and based on probability, bet big. I don’t often have good luck. I jump on the Martingale system after it’s been on a single color streak and am often lucky to break even. How to you factor in horrible luck to statistics? Thanks for your comments Andrew. Incidentally, my teaching comment was in regards to Roflkartoffel offering that they would not teach English…for whatever reason, not you. Hi, I just stumbled across this site after doing a quick Google search. I recently watched a short youtube clip on Reddit about increasing your odds at the roulette table, and I’m curious to find out whether the strategy presented in said clip is a valid one or not. It basically deals with the same strategy as discussed in this article. But in stead of betting from the get go it says that you should only bet after the ball has ended up in a specific coloured slot four times in a row. Then, and only then do you place your bets on the opposite colour, and do so three or four times, doubling your bets after every round so you can recoup the money that you lost in the previous round. My question is, does this strategy work, or is it just a bunch of hocus pocus? The strategy from the youtube clip doesn’t lead to any greater chance of winning than employing the Martingale system alone. This is because each round is independent of the previous rounds (the table has no memory), so you are no less likely to see a red after 4 consecutive reds than after 4 consecutive blacks. The clip is correct in stating that a run of RRRRR is less likely than RRRR, but none of these probabilities affect the likelihood of the next round (the one your are betting on) being R or a B. It is the accumulation of probabilities from the point at which you start that you need to take notice of, and they stay the same regardless of all that has gone before them. if you looat the previous results you can look for statistical anomalies. Like 26 out of 30 are black, but just based on that you still can`t make any useful predictions. A little bit more sophisticated method is when you look for those anomalies. Like we have already calculated the odds of 7 reds in a rw as 1/128. So if you would wait until you see a series of 6 reds in a row the probability of the next being red is still 18/37, but the probability of 7 reds in a row is only 1/128. So it is time to bet on the black now ant then start to increase your bets. Same kethod can be used if you track the exact numbers in the past 5 turns and if you see 2 repeating numbers the probability of having 2 pairs in the last 6 turns is very low. So it is time to bet on all thenumbers except for the last 4 different ones.